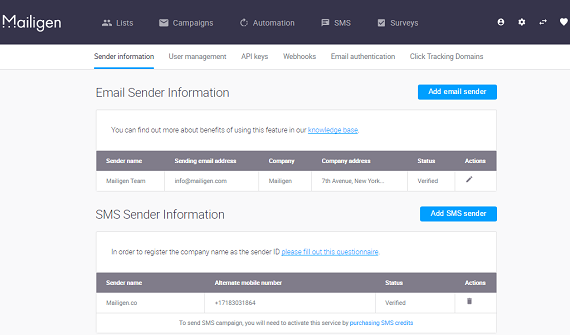 Sender names represent the email address from which outbound email is sent from our system. 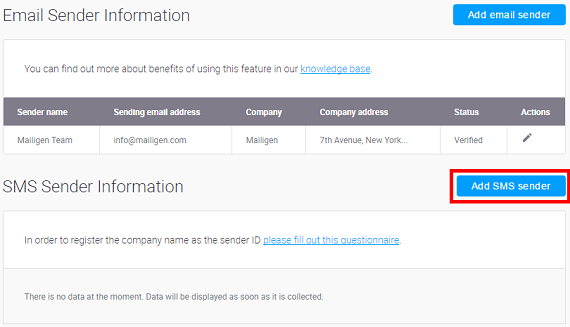 Select the Sender Information option from the Account Settings Menu in the upper right-hand corner (accessed by clicking on your name). Add a new email sender by clicking on Add email sender button. Edit an email by clicking on the Edit Icon. This will bring up the Sender Name Window. Zip/Postal Code—the zip or postal code associated with the email address. When you have finished making changes, click the Save Button. Alternatively, you can click the Cancel Link to close the window and return to the profile screen. Note: Each email address that you add must be verified before it can be used to send outbound email from our system. 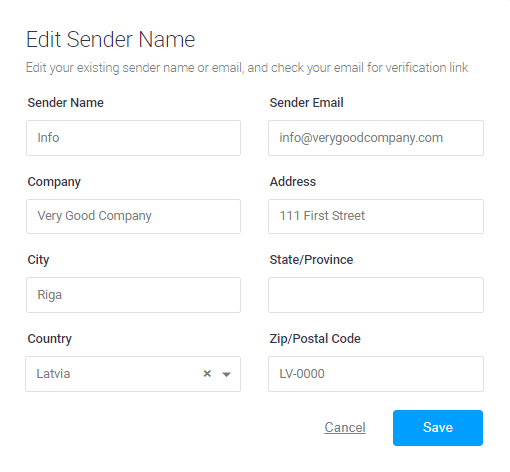 When you add an Email Sender, an email verification will be sent with a link that must be clicked before the email address will be marked as verified. Note: You must have at least one verified Email Sender on record in order to send outbound email through our system. You cannot delete an Email Sender if it is the only Email Sender on record. The SMS Sender Information section of your profile includes phone numbers that are used to send outbound SMS campaigns from our system. Add a new SMS Sender by clicking on the Add SMS Sender button. This will open the SMS Sender ID Request Form. Desired SMS Sender ID or name — an alphanumeric ID that can be a company name, brand name, or phone number. Note: The Sender ID feature only applies to network operators that support this feature. For example, you cannot use custom Sender Ids when delivering messages to the United States of America or Canada due to limitations with the USA and Canadian mobile network operators. The messages might be delivered from a randomly assigned number instead or the alternate number you provided when requesting your Sender ID. Note: this cannot exceed 11 characters. 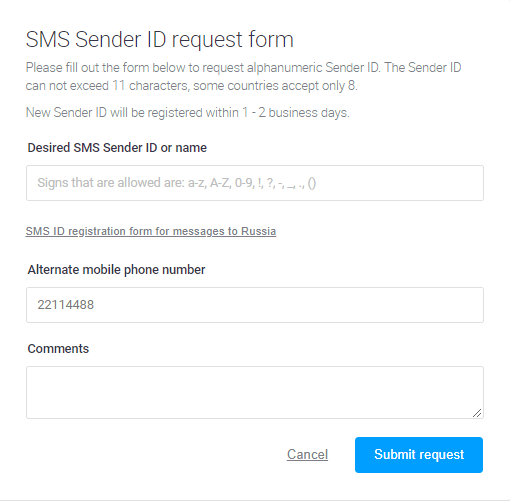 SMS ID registration form for messages to Russia — if you want to send messages to Russia, this form is mandatory, otherwise, you can skip the form. Alternate mobile phone number — an alternate mobile phone number for those operators that don't support the Sender ID feature. Note: Phone numbers can be informative, but recipients won't be able to reply to the messages directly. When you are finished, click on the Submit Request button. This will close the window and return you to the profile screen where the SMS Sender Name request status will be indicated. Note: The request will be sent to our system where it will be processed within one business day.